From the Greedo doll we gave Liam, to father and son (and schnauzer) matching Star Wars tie shirts and party hats, we went very DIY. Thanks to my parents we also made the food and gave it all fun Star Wars names. My mom baked the best little ewok cake for Liam inspired by AntVar’s photo on DeviantArt. Some of the party food was inspired by Star Wars parties thrown by KitchenFunWithMy3Sons.blogspot.com and JustJENN of JustJennRecipes.com. Thanks to their craftiness and ours, we pulled off a celebration that was out of this world for our little boy. We filled a buffet-style table display with traditional finger foods and snacks and gave them fun Star Wars names to keep with the theme. Tater tots became Tusken Raider Taters and hamburgers became Han Burgers. 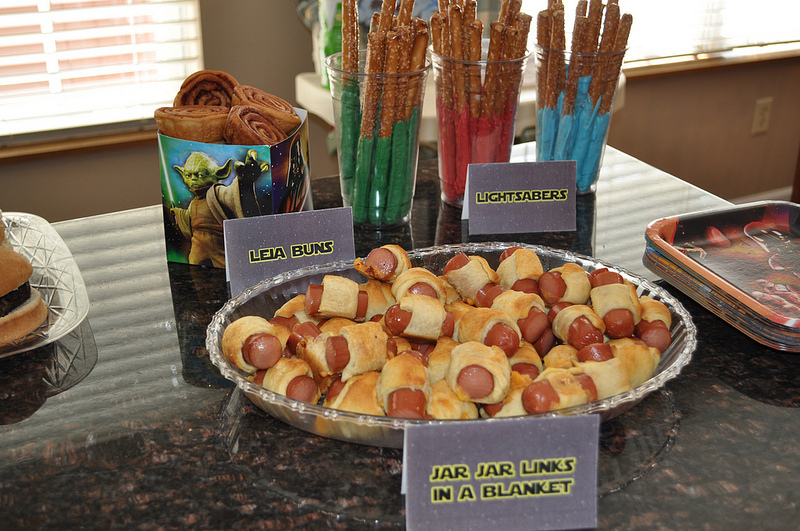 We cut hot dogs into thirds and wrapped them in strips of crescent roll dough with a little cheese to create Jar Jar Links in a Blanket, and pecan rolls became Leia’s Buns. My mom dipped the ends of pretzel rods in red, blue, and green melted chocolate to create Lightsabers. A combination of lime sherbet and Sprite made Yoda Soda, which was a hit! We decided to go with cupcakes instead of a traditional sheet cake for our guests. Using Star Wars cookie cutters and stamps from Williams-Sonoma, fondant Stormtroopers, Darth Vader helmets, and Yoda heads topped confetti cupcakes. My mom is a wizard with cake, and she just happened to have a little stand-up bear cake pan that she was able to transform into an ewok for the occasion. It was my first time working with fondant, and it was not kind to me. My fondant work to create the ewok headgear was a little sloppy, but I don’t think Liam noticed. When it was time to dig in, he didn’t want to have much to do with the cake at first; I don’t think he liked the texture of the icing. 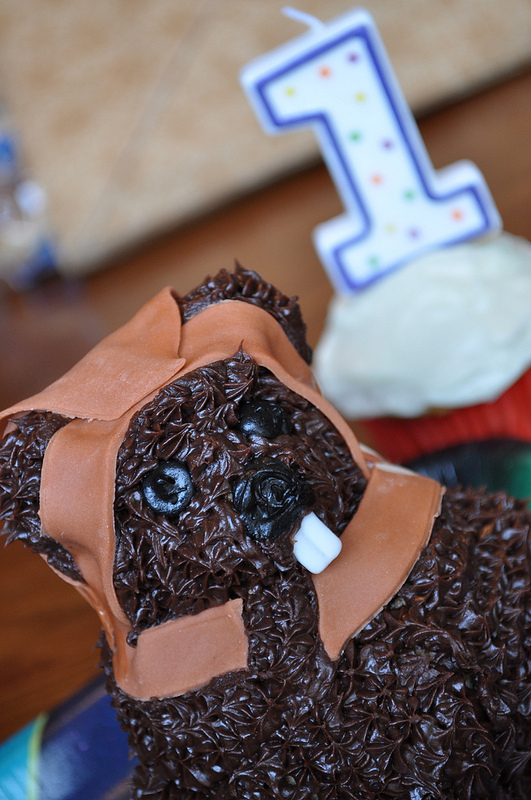 Eventually the ewok’s head toppled over and he gave the confetti cake a second chance. Liam’s Aunt Lora got him a onesie a few months ago that had an adorable little tie sewn on the front. 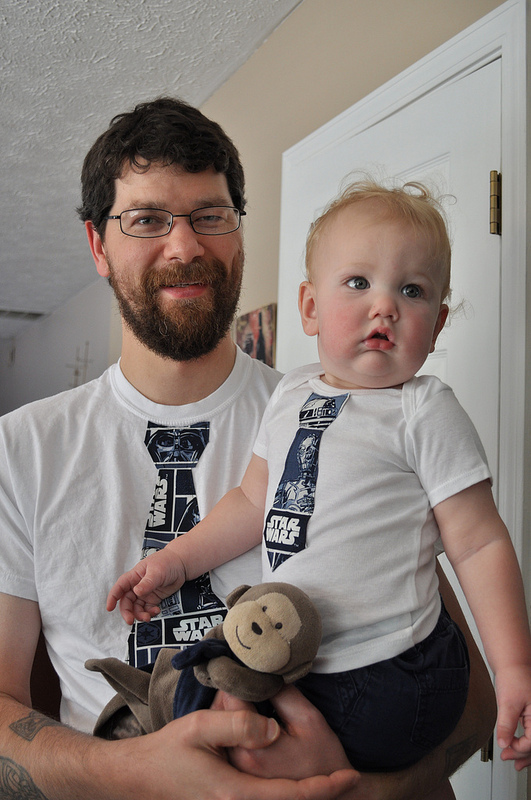 I loved the look of the faux tie so I decided to make Liam a special shirt to wear on his big day using that idea, but with Star Wars fabric instead. Thankfully, JoAnn Fabrics sells a few different Star Wars prints, so I set to work creating a pattern to re-create the look. 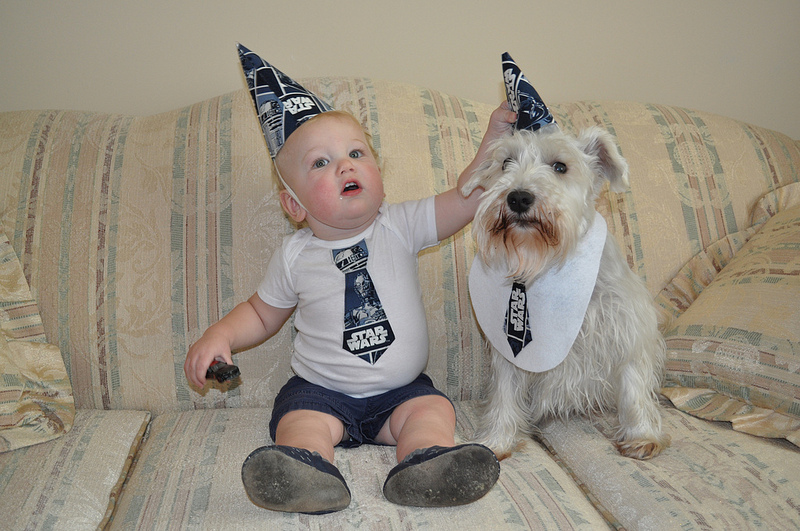 But of course I couldn’t stop there; at Lucas’ request I made a matching shirt for him, and even fashioned a tie “bib” for Liam’s best buddy, Winston the schnauzer, to wear. I had plenty of the fabric left to make party hats, too. For the free pattern and tutorial, check out this post. I had my sewing machine out more these past few weeks than I have all year! It was a lot of fun prepping the little details that made Liam’s first birthday party memorable. I can’t believe our little boy is a year old! The year has gone by so fast. I can’t wait to share the memories of his first birthday party with him one day. Thank you to everyone who helped us celebrate Star Wars style! so cute! where did you get the font for the food cards?